Two children of Aboriginal women and sealers were able to escape their displacement to the Bass Strait islands and return to the mainland of Tasmania. Their stories encapsulate much of the experience that has shaped the identity of Palawa families today. Dalrymple (Dolly) Briggs (c 1812–98), probably born on Preservation Island, became famous as the first 'half-caste' to be born in Tasmania. Her mother, Woretemoeteyenner, was sent away with the sealer George Briggs by her father, a leader in a north-east nation. When Briggs brought her to Port Dalrymple, she escaped into the bush to her tribe, but her baby was thrown into a fire, presumably because its father was white. Her subsequent children, including Dolly, were all separated from her and left in Launceston. Dolly was fostered by Dr Jacob Mountgarret in Port Dalrymple, and was taught to read, write and sew. She went to live near Deloraine with a convict named Johnson. There she was visited by James Cubit who, notorious for his atrocities against local Aborigines, had been speared by them. Dolly and her children were attacked when Johnson was away, and became celebrated as word spread of this 'admirable half-caste' who held out in a six-hour siege until Johnson returned. She was rewarded with a land grant of 20 acres in Perth and allowed to marry Johnson. Later, Dolly and her husband opened a public house on the banks of the Mersey River, and her mother was allowed to leave Wybalenna to live with them. Fanny Cochrane Smith was born at Wybalenna in 1834, the daughter of Tanganutura, which means 'to weep bitterly'. Abducted as a young girl by the sealer James Parish, at Wybalenna Tanganutura took Nicermenic as her husband. At the age of five, Fanny was taken from her parents to live with the prison catechist, Robert Clark, and three years later she was sent to the Queen's Orphan School in Hobart to be trained as a domestic servant. She was returned to Wybalenna to Clark's service where she stayed until it was closed in 1847. Fanny was often chained and flogged by Clark as punishment for rebelling against his treatment of her. Palawa people who had survived Wybalenna, including Fanny, Nicermenic and Tanganutura, were sent to Oyster Cove, an old convict station near Hobart. Five years after Nicermenic's death, Fanny married an English sawyer named William Smith in 1854 and the government awarded her an annuity of £24 for the rest of her life. She set up a boarding house in Hobart, but soon moved nearer to Oyster Cove where her mother, sister and brother were still living. 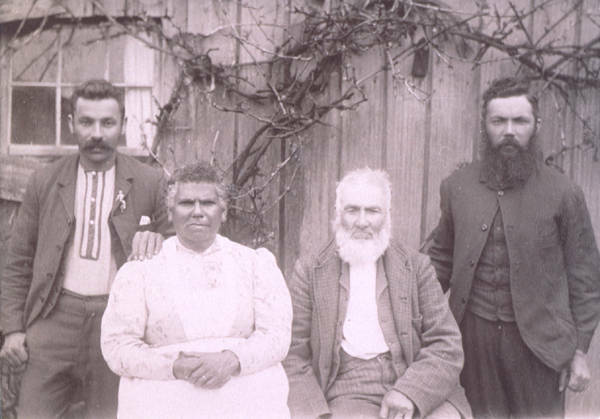 Fanny was given a grant of 100 acres and settled at Nichols Rivulet, often visited by her close friends Truganini and William Lanne. By 1889 she had been granted deeds to 600 acres and been formally recognised by parliament. In 1899 a concert was held in Hobart in her honour, and she spoke of the quality of her people and their love of honesty and sang traditional songs, which were recorded, probably the first recording of Aboriginal song in Australia. They are still held in the Tasmanian Museum and Art Gallery. It is from these tumultuous origins that contemporary Tasmanian Aboriginal families trace their forebears. Almost all the families surviving today are descended from sealers' women, notably Dalrymple (Dolly) Briggs and Fanny Cochrane Smith. Children of such women, perhaps because of their unique experience of the nexus between black and white cultures, and the hazards of survival in this setting, proved to be the key to survival of Palawa culture. Further reading: N Plomley (ed), Friendly mission, Hobart, 1966; N Plomley & K Henley, The sealers of Bass Strait, Hobart, 1990; H Reynolds, Fate of a free people, Ringwood, 1995; H Roth, The Aborigines of Tasmania, London, 1890; L Ryan, The Aboriginal Tasmanians, Sydney, 1996.